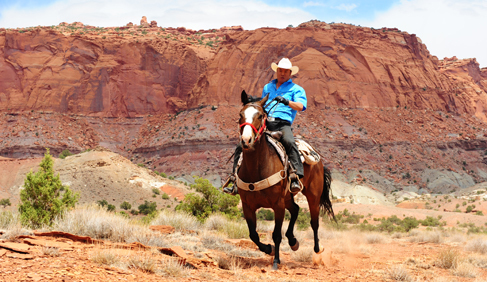 Trail riding in Utah’s red rock canyonlands surrounding Capitol Reef National Park! 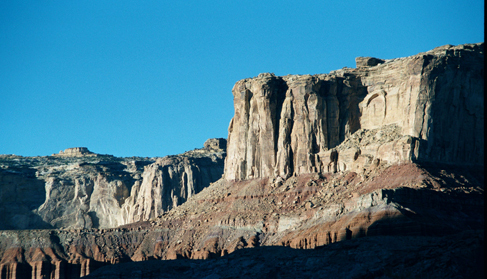 Utah’s canyonlands was the last explored region in the continental United States. Bounded by the Grand Canyon on the south and the Uintah Basin on the north, this New England sized landform is often referred to as the Canyonlands, Canyon Country or 4-Corners Area. It is the largest tract of unspoiled territory in the lower forty-eight and is the home of more formally designated parks, monuments, conservation and wilderness areas than you can shake a stick at. Modern writers have mythologized this landscape as the “Great Back-of-Beyond” and “The Place Nobody Knew”. Pat Kearney along with her husband Gary George of Hondoo Rivers & Trails have been exploring Utah on horseback for over 30 years. She takes riders on multi-day camping and inn to inn rides through some of Utah’s most stunning national parks and areas for viewing wildlife and wild horses--- like Capitol Reef National Park. Hondoo’s trips focus on scenic and distinctive landforms in the middle section of the Colorado Plateau west of the Colorado River. 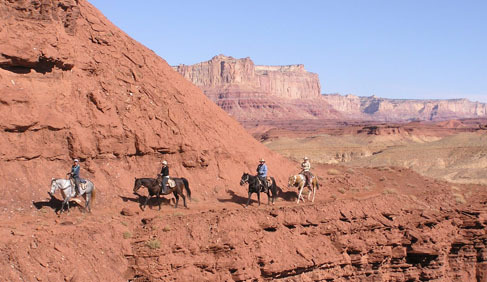 Hondoo outfits a full schedule of multi-day horseback riding vacations featuring camping or inn lodging. They can also arrange custom day or multi-day backcountry trips which afford you the opportunity to travel Utah by vehicle, horse, raft, or/and foot. 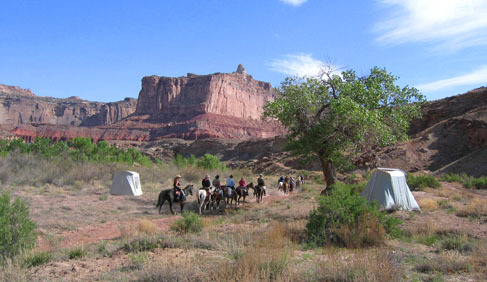 Each Utah camping ride is unique and seldom covers the same backcountry trail or uses the same camp site more than once or twice a season. These base-camp rides are supplied by 4X4 vehicles. The camp location is generally situated at a higher elevation in mid-summer and a lower elevation in spring and fall seasons. Areas explored: Capitol Reef National Park, Grandstaircase-Escalante National Monument, San Rafael Swell Wilderness, or Utah’s High Plateaus. 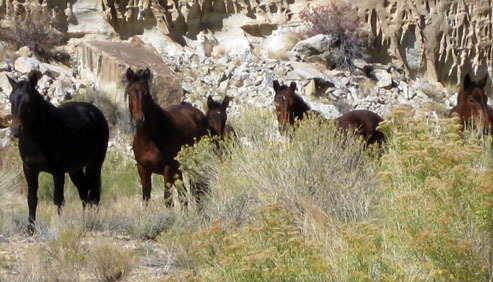 Sensitive to the fragile environment, Hondoo Rivers & Trails implements low-impact camping techniques, small group sizes, well-maintained equipment, and top-notch horses. You will have access to rugged and scenic landscapes of immense scale, with an unencumbered and comfortable ambiance where you can relax, refresh, and rejuvenate prior to your next day’s adventure. 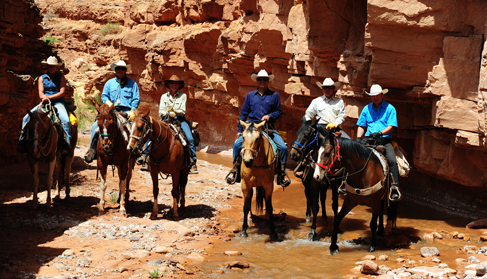 As an owner operated facility, Pat Kearney makes sure that guests receive personal attention and service while exploring the backcountry of the Colorado Plateau. Riders may choose to camp out at a deluxe basecamp or stay in comfort at night on an inn-to-inn adventure. This outfitter strives to give experienced riders all the pace and challenge they desire, and to give inexperienced riders all the instruction and patience they need. Time and logistics permitting, she often divides into two groups riding to separate destinations or scenic features. Non-riding companions are welcome on all trips. For the trips that feature camping, all equipment is provided–– cots, mattresses and inflatable pads, freshly laundered sleeping bags, blankets, chairs, showers. Guests sleep in tents at sites that are supported by four-wheel drive vehicles.These camp wagons bring what is needed for cooking, eating, a shower tent, chairs and commode, as well as feed for the horses. Guests stay in tents for single or double occupancy. Hondoo's tents are similar to wall tents, but with floors. Guests can stand up, and also bring in a chair. A base camp is the setting for most rides. The first night guests have a motel stay and orientation in Torrey. For the inn-to-inn riding vacations, guests stay at Bed & Breakfasts or lodges. Boulder View Inn is one example. Its modern facilities include in-room phones with free local calls, free high speed Internet, and television. Torry Schoolhouse B&B and Muley Twist Inn are two others. Camping rides: Prepared at camp- a varied menu of fresh foods including hormone free, grass fed beef along. Hondoo's great camp cooks have the ability to accommodate to most diets with prior notice. Cooks prepare fresh and locally sourced foods at meals and offer grass fed hormone free beef. Inn trips: Breakfast at the Inns, trail lunches and sampling of local restaurants for dinners. 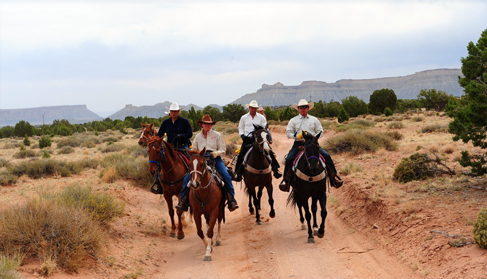 Featured in Equitrekking Utah, part of Equitrekking’s Emmy award winning third season on Public Television. These backcountry adventures have been featured in many prestigious publications including the New York Times, National Geographic Explorer, Sunset Magazine, Time magazine, and Western Horseman. Observers have lauded their guide service for its educational value, and the experience and professionalism of their crews. 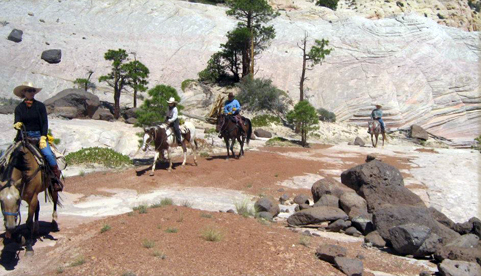 Trail riding in Utah’s red rock canyon lands surrounding Capitol Reef National Park! 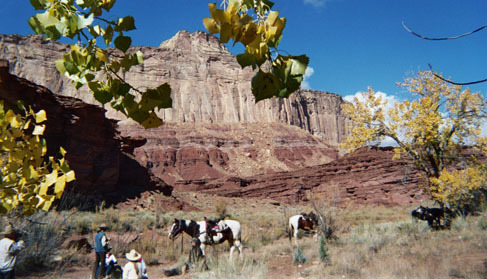 Utah riding vacations in Capitol Reef National Park and Utah's canyon lands with longtime backcountry outfitter featured on "Equitrekking." Camping trails rides or inn-to-inn vacations. April through October. Weather is semi-arid with little precipitation other than snow in the winter and thunderstorms in the summer. Temperatures rarely exceed 90 degrees or fall below 40 degrees Fahrenheit. Travel Agents Accepted- Hondoo Rivers & Trails works with travel agents! 10% discount for groups, couples, or multi-ride bookings.